I was adopted at birth, and raised as an only child, therefore, I do not come from a large family, but a small, close-knit one. I’ve known I was adopted for as long as I can remember, so for me, family never meant you had to have the same ‘blood‘. I assume that is the reason why I have always preferred having a few deep yet meaningful relationships over having a ton of ‘friends’. By the time I was in high school, I had figured out that although being popular looked appealing, it was more work than I was willing to go through, especially for what little I saw these people receiving as ‘payout‘. I suppose it was a good thing I felt that way seeing how I have always been a little shy and somewhat awkward around people I did not know. Not to mention, I do not do small talk, I just don’t. If I do not feel drawn to you, I will not engage conversation. I won’t be rude or anything, I just do not feel the need to fill the air with uncomfortable jabber, when I am perfectly at ease with the sound of silence. As an adult, I actually met my biological mother, and found out that I have 3 siblings (2 brothers and a sister), as well as a beautiful niece and 2 wonderful nephews. I instantly connected with my sister, and I am thrilled that she and her husband are a part of my life. I haven’t had the chance to really get to know my brothers, and I’m ok either way on that – I have never had an urgency to connect with people just because we are ‘related’*. 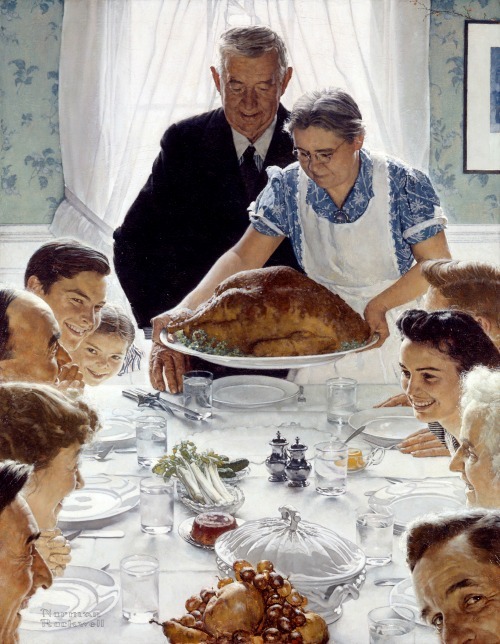 Now – the topic of this post, four paragraphs in, is to explain how in my family, family is actually more than the image depicted in most of Norman Rockwell’s paintings. I remember hearing some one say that “friends are the family you choose”, a statement that truly resonated with me, and when I looked at my relationships, I found that it was true. My true friends, those who are a part of my life, are my family. I claim them, I call them that, and I love them unconditionally, just as I do those who are my family in the traditional sense. I feel extremely blessed to have developed those relationships over the years, with people that I have no doubt whatsoever, that if I need them, they will be there for me, and I believe they know the same is true on my end. We live in a time when social media may make it easier to reach out to people, but it doesn’t always draw us closer, just as it makes it easier to find people, and just as easy to lose touch with the personal side of, well, getting personal.